Ordering Is Simple: Purchases can be processed via email or by phone. We accept Visa, MasterCard, and Personal or business checks. Sales tax applies to purchases delivered within California. All sales are final. Pieces are subject to prior sale, and prices are subject to change without notice. Shipping and Delivery: Pine Trader Antiques can get quotes on shipping and make delivery arrangements for your purchases. 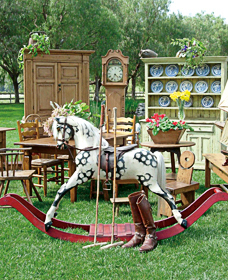 We use only specialized antique delivery people whom we have been dealing with for years. They handle every piece by hand and offer blanket-wrapped, in-home service. Small items can be shipped via UPS or similar services. Shipping of large items is not a problem. Purchasers are responsible for shipping and insurance charges. Shipping charges for UPS or similar services must be prepaid. All other shipping charges are freight collect, meaning that you pay for shipping the item when you receive it. Call or email us anytime with questions or special requests. Rest assured that we will do our best to serve you. or email the Pine Trader.